Acquired: Signed as a free agent by the Toronto Argonauts on April 21, 2017. 2016: Started in 18 regular season games in his 10th season with the Alouettes…marked the fourth consecutive season that he appeared in every regular season game. 2015: Started 18 regular season games in his ninth season with the Alouettes…named an East Division All-star and the CFL’s Jake Gaudaur Veteran’s Trophy recipient. 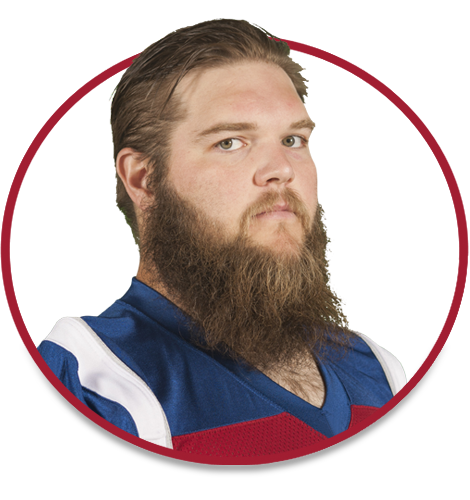 2014: Started in 18 regular season games in his eight season with the Alouettes…named East Division Most Outstanding Lineman. 2013: Started in 18 regular season games in his seventh season with the Als. 2011: Played in 18 regular season games in his fifth season in Montreal. 2009: Played in 18 regular season games in his third season in Montreal. 2008: Played in 18 regular season games in his second season with the Alouettes. 2007: Played in eight regular season games as a rookie with the Alouettes. 2006: Selected by the Montreal Alouettes in the third round (24th overall) of the 2006 CFL Draft. Played four seasons (2002-06) at Tulsa…started 49 consecutive games at right tackle for the Golden Hurricane.